Late last week, Google announced that it was teaming up with six Japanese firms, including SkyPerfecTV and Mixi [Ja], creator of Japan's most popular social networking software, to link content [Ja] to a new YouTube website exclusively in Japanese in order to boost the company's presence in Japan. Much to the frustration of organizations fighting for the rights of authors, composers, and composers, as well as companies and copyright organizations, Google plans to continue with its plans for the use of video “fingerprinting” technology. The fingerprinting technology, which would identify copyrighted material and allow the copyright holder to search for illegal copies on the web, has been criticized as being insufficient to answer concerns over copyright violation. Blogger Nobuyuki Hayashi, who blogs at nobilog and also at a less frequently updated English version, was at the meeting where the merger announcement was made. In his entry of August 4th, he posted pictures taken at the meeting, and linked to articles in Japanese at ascii.jp, Broadband Watch, CNET Japan, and IT Media News. 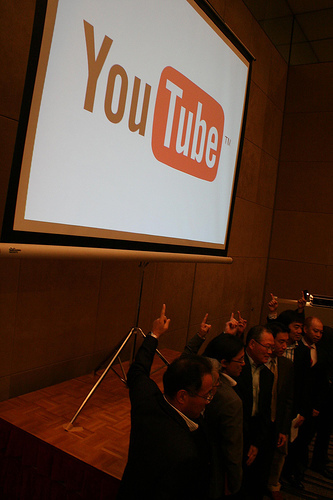 He also outlined his thoughts on the new direction of YouTube in Japan, translated below. There were two things that I felt about this explanatory meeting. One of them is that it would be very interesting if, using the YouTube wave [of popularity], an inversion phenomenon occurred between the minor media and major media. As the other articles above also make clear, while there were speeches by the major partners [in the deal], what caught my attention the most was actually TokyoMX TV, a local Tokyo UHF channel. In fact, the same channel has for some time been posting a part of its content, from Blog TV, etc., to YouTube. This station has the name “Tokyo Metropolitan Television”. What an international feel it has. 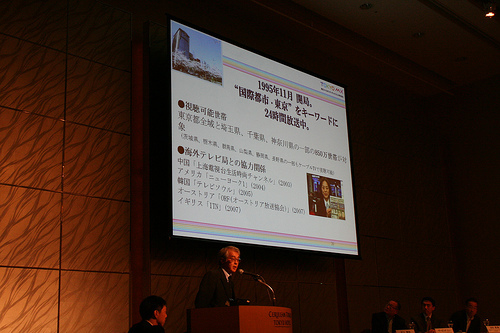 What is more, programs on this station are transmitting information about the pioneers in Japan's IT industry. It gives you the feeling that this television station is from Tokyo, the city on the cutting edge. There is the the possibility that people from other countries who see Tokyo MX videos on YouTube and thus know of Tokyo MX may not even know about NHK [Japan's national broadcaster] or the so-called key commercial TV stations. With this in mind, I listened to what MX board member and head of the technology bureau Tanuma Jun had to say at the explanatory meeting, and found his talk interesting. 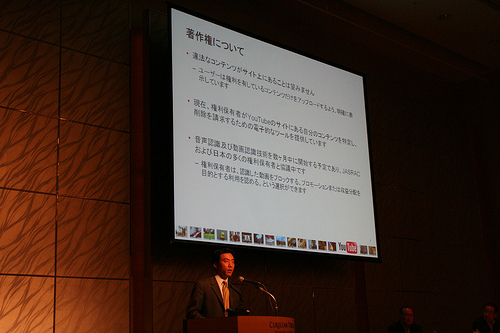 Mr. Tanuma showed a slide indicating that “once a contract for videos of the work of independent artists has been cleared, they are then uploaded to YouTube.” He also added to this, however, that there is the possibility that in the near future, there will be an increasing number of artists saying: “If you upload my video to YouTube, then I would really like it to be uploaded to TokyoMX as well”. This means that, if the video goes to Tokyo MX, then it becomes legitimate TV material that can be picked up and used by television stations; in addition, transmission of the finished TV program is then not only directed to areas in the Tokyo region, but is also directed to the whole world. The populations of Japan (126 million) and that of the English-speaking world (900 million) are not even really comparable, and while Japan may have the second largest number of YouTube viewers in the world, the total number of people using YouTube from other countries is greater. I often hear talk about how, in other countries, people make a make of money through Google AdSense. Even though the English-version of this blog (nobilog) has been updated less often than the Japanese-language blog, the earnings have been greater [in the past]. However, the reason for this is not that the earnings through Google AdSense one-click are high, but simply because there are overwhelmingly more people (people who come to read every post, people who arrive through links from other sites, and people who come to the site through search results) reading the articles written in English (by the way, the AdSense allocation [algorithm] was later optimized, and currently earnings from advertisements on nobilog2 exceed [earnings from the English-language nobilog]). just maybe, through their continued grumbling, the people at the copyright organization JASRAC may have signed their own death warrant. I've heard that, in order to manage copyrights, YouTube is planning to develop and use fingerprinting technology [for identification of online content]. If, that is, this fingerprinting technology can be refined to a level where it can be practically used. In other words, let's say, they are trying to complete an engine which would automatically recognize, within videos or audio that has been uploaded, content that violates copyright laws. This engine will at first only be used by YouTube, but in the future, it may also be used in the development of a bootleg search engine which would search websites other than YouTube and check whether the sites contain illegal content. At that point, would the world really need a copyright organization anymore? That's my thinking. In the end, the reason that copyright management organizations were necessary was that the companies producing the [copyrighted] content did not individually have the capacity to each go around searching for illegal copies. However, thanks to fingerprinting, if the trouble involved in such operations can be greatly reduced, it may be that these management organizations will be done away with as the no longer needed middlemen, as it becomes possible for content providing companies to independently manage their copyrights (of course, searching for violations at live venues and karaoke bars is something that will probably take more time…). It seems that what this technical innovation would finally lead to is something that Creative Commons is also aiming at, and this is copyright information integrated directly within the [copyrighted] content itself. If [the owner does not want] certain content to be quoted at all, then the content can be identified [with the restriction of] “All rights reserved”; if [the owner of] certain content wants it to be promoted as much as possible, then the content can be identified as such; and content to be used in a particular country or region can be identified accordingly as well. If things proceed in this manner, then the circulation of contents may steadily increase, while at the same time the protection of copyrights around the world will also be greatly advanced. Wow, Chris. Thanks for translating. I know I should be blogging in English but with all my past due works, etc. I can’t spend too much time blogging. While most of my messages are intended for Japanese audience, I tend to blog more in Japanese. It is such a shame that Japan, a country well-known for great consumer electronics, is so much behind in IT literacy; I think Japanese people tend to lack long-term perspective, generalization and optimism which make things difficult for venture companies to survive here. No problem, it was an interesting post + great pictures! It will be interesting to see how things develop with the new YouTube Japan site. but how do they stop bloggers like japanprobe uploading TV and news content to youtube?